Oupaav means effort, avar means other, sabh means all, thiaagia means to give up. I have given up all other efforts and dhaaroo naam laeiaa - I have taken the name of God as my medicine. Guru ke piareo, usually what we see in the world is that only when all else fails do we turn towards naam, the name of God, do we turn towards baani - the romanized. But Guru Arjan Devjee says, avar oupaav sabh thiaagiaa - I've given up all other hopes, dhaaroo naam laeiaa - I am taking the medicine of God's name. Then what happens? Those people who give up all other hopes and put all other hopes into God's name, what do they get? Thaap paap sabh mittae rog - sabh means all, mittae means eradicated. What is eradicated? Their thaap - fever, paap - their sins, rog - their diseases. Gurujee says if you were to put your hopes in the name of God, if you were to put all your faith in the name of God, if you were to take the name of God as the true medicine which can take away all diseases then what will happen? All of your diseases, all of your sins will be taken away. Seethal man bhaeiaa - your mind will become completely cooled, completely soothed, in complete peace. If you just put your hopes, your faith in the name of God, renounce putting your faith and hope into other, put it instead into Waheguru. Take the name of God as the ultimate medicine and that will cure you of your diseases and you will have peace, this soothing coolness in you. By worshipping pooraa guru - the perfect guru, sagalaa - not one, not two but all of my pains are gaeiaa - are gone. By meditating upon the Guru, by worshipping upon the perfect Guru all pains, all diseases are eradicated. Someone who has experienced that level, who is at that level where their diseases, their pain has been eradicated, what do they say? Gurujee says raakhanehaarai raakhiaa - they do not says that it was because of me, it was because of I, they do not speak of ego. 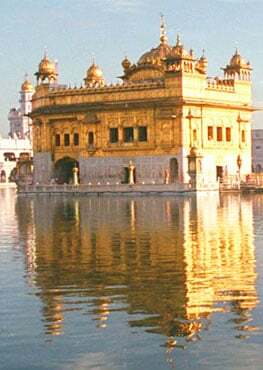 They say raakhanehaarai raakhiaa - the protector, the saviour, the liberator, that Waheguru whose nature it is to protect, who is the protector, Wahegurujee raakhiaa apanee kar maeiaa and blessed me with that grace. Rehaao - pause and think about this today. If you one step towards the Guru, the Guru will take millions towards you. What does that mean? To take one step towards the Guru means to put your feet on the path. Once you put your feet on the path of God, God will take you. He will pull you by the arm. We may be surrounded by darkness at certain times in our lives but amongst that darkness if you light the candle of God's name within your, if you put your hopes upon that Waheguru, Waheguru WILL take you out by the arm, Guru Arjan Devjee Maharaj says. Simra simar - by meditating, by reciting the name of God, many times we ask how are we going to recite the name of God? It's very simple, recite the name of God with your tongue and listen with your ears to the name of God. Reciting the Waheguru mantar with our tongue and listening with our ears, listening to every single syllable of the word - that is the way of naam simran. We can begin form 5min, 10min, 20min whatever it is that we can. Simply to recite the name of Waheguru with our tongue, what will happen? Man than sukhee - inside your mind there will be peace, the peace of mind which you've been looking for all over the world. You won't get it there, you will get it in the name of God. Not only will your mind be at peace but your body will be blessed as well.